How To Have a Family Photo Day | A Savings WOW! Many people take this time of the year to update their family photos. We are one of those families. From our first photos that we took as an engaged couple to the pictures we now take as a family of six, we’ve had a wide range of experiences and settings regarding family photos. – Determine who you would like to include in your family photo. Will it be just the kids? Will it be the parents and kids? Will you include any other family members in the photos? – Pick a location. Would you like it to be scenic outdoor photos? Do you prefer a professional portrait studio with a variety of backdrops? Would you rather set up a tripod with a timer and do it from the comfort of your own home? – Coordinate the colors and types of clothing you’ll be wearing in the photo. We’ve found that having a similar clothing style or complementary colors are more pleasing to the eye when the photos come out. Also avoiding lots of different or contrasting patterns and colors will make it a more attractive photo. – Make sure everyone is fed and happy. Pick a time when everyone is comfortable – after naps, after you’ve eaten, and make sure they are dressed appropriately (so they’re not sweating and not freezing). – Our biggest tip is to just have fun with it! We’ve found that our best family photos have been not necessarily with the poses or the backgrounds we originally planned for, but for the spontaneous ones that happen in-between. Sometimes it takes a few shots before you all start to feel more comfortable and your true personalities are able to shine through in the photos. Since your family photos act as a snapshot of how your life is like during a certain period of time, don’t you want it to be with authentic expressions? We’d love to know what some of your tips are on how to have a wonderful family photo day. Please leave a comment below with how others can have a fun family photo day! What can you do with the photos after you’re done? One suggestion is using them to make customized Christmas cards. Another is making personalized photo books. Shutterfly has a wide selection of both of these, along with other holiday cards and photo gifts. 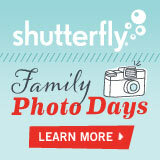 Check out Shutterfly’s Family Photo Days website for more ideas on how to make your own Family Photo Day special. They also have a digital toolkit that you can download for more ideas and suggestions. See how Shutterfly can help you make your Family Photo Days more memorable! Disclosure: Shutterfly is providing us with 50 free cards for sharing this information with our readers. All opinions are our own honest opinions. Please see our disclosure policy for more information.